Our post on how to install DSTV and other digital satellite TV services while good, was lacking on detailed instruction for digital terrestrial TV services. As we all know, GoTV is very popular in most African countries as a result of its services availability and their competitive pricing model. It is a digital terrestrial TV service that works via TV masts and accessible only in areas with GOTV transmitter coverage. This explains the reason while it’s cheaper than DSTV and similar satellite TV networks. Today’s publication is a bit different from that of TSTV satellite intro as its focus is on showing you how to install GoTV network the right way. 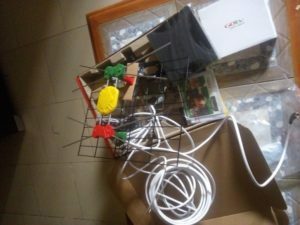 It is a detailed tutorial and guide on how to install or setup the GoTV decoder and antenna for better service reception. To be able to install or setup your GOTV services correctly, you need to have these basic tools on standby. This is assuming that you’ve already bought the GoTV decoder from a registered dealer or from any of the GOtv offices nearest to you. 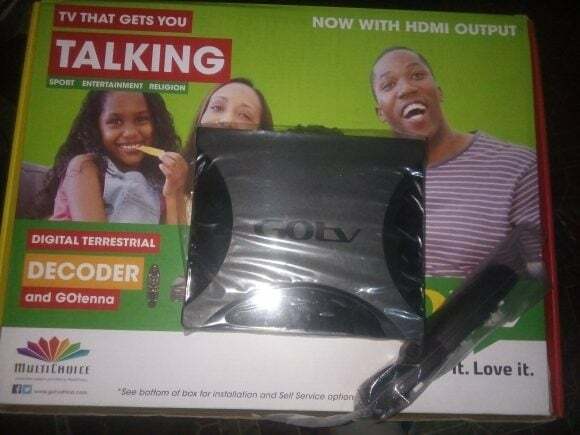 For emphasis, GOtv pack (antenna and decoder) comes with almost everything you’d ever need to complete the installation, including a user manual with a detailed GOtv installation guide. A round metallic pole for mounting the Gotenna on Upstairs or high-rising buildings (note: galvanized poles would last longer than regular black iron poles). 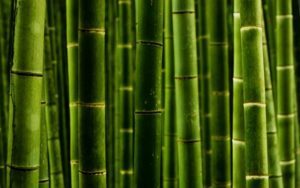 Long bamboo poles (normally used for scaffolding) for mounting the Gotenna on an open space around your surrounding. 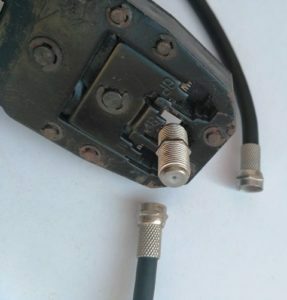 A couple of F connectors and 1 full roll of Coaxial cable (Optional for those connecting the antenna from a far distance). A careful observation of the positioning of your neighbor’s GOtv antenna (Optional for first time installers). The Gotenna is the first thing you should set up and clip it to a pole (preferably a long pole so you can get a very strong signal quality and strength). This is how to fix it for proper GOtv services reception. Get the Gotenna and 30 meter long cable out of the box (handle with care). Pass the white or black cord wire through the Gotenna grid and screw it into the hole provided at the back of a yellow plastic box on the Gotenna. (This plastic is very visible on the Antenna). Once the cord is well secured into the plastic box, gently slid it (the yellow plastic box) through the waterproofed sleeve to ensure everything is okay and well guided. Now, clip the red and green plastics on the Gotenna to the ones on the Antenna grid respectively. Ensure they are well clipped to each other before proceeding further. Search your GoTV kit or pack and look for a U-shaped bracket, take it and pass it through the middle of the of the Gotenna. (This U bracket will help the pole bracket to hold your Gotenna to the pole firmly). At this moment, get your pole and place it in between the outward facing Pole Bracket and then use the wingnuts from the kit and fasten up the pole to the pole bracket. Stand the pole erect and secure it to the ground firmly (This is assuming you aren’t going to use the house roof, wall or the building’s wooden fetcher boar). You have just succeeded in setting up your Gotenna. Now get a satellite signal finder and look out for an angle with the strongest signal quality/strength (Optional for techies). This is all you’d need to know about how to install GOtv antenna by yourself. You can now safely proceed to how to install the decoder and start exploring the channels on your default subscription pack. Bring out the decoder from the kit and connect it to your Television using the provided AV (Audio and Video) cables. Connect the cable (the white/black cord wire) from the yellow plastic on the antenna to the RF In plug at the back of the decoder. Connect the power cable and plug the end into a wall socket. It is recommended you use a power surge protector. Switch on the socket and power up your TV and GoTV decoder. Using your TV remote control, switch to the right AV channel where GoTV will be showing (Usually AV 2 channel). GoTV will boot for a few seconds and prompt you to select your language option and country. After this, GoTV will launch an automatic channels scan and this might run for some minutes (About 3-8 mins). All the TV channels and stations included in your current subscription pack will appear after the scan. It should be about 100 TV channels and 4 radio stations. Now let’s move on to getting your GOtv decoder activated for limitless entertainment and musics. 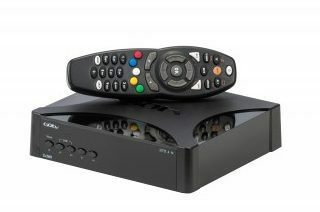 You can activate your new GOtv decoder through any of these methods. Activating Online: To activate your GOtv decoder online, simply visit this Link and fill out the form, that’s all. Your decoder will start working a few minutes from the form’s completion. Using SMS Short-codes: If you are unable to connect to the internet, then you should try this method. NOTE: standard SMS charges from your network provider applies. Accept*your_IUC_number*your surname*mobile number*your city*the product. Use the asterisk to separate each field. First, you have to type Accept, followed by your decoder IUC Number (This number is found at the back of the decoder), then type your Surname (This is what will be used as your Username), type your mobile number and the city you are living in. Lastly, type the product you’re activating – this should be GoTVPlus. Now send the SMS to Your country short-code. List of all the available country short-codes is presented in the table below. Activating your Decoder via USSD: Simply dial *288# from your phone’s default dialer and follow the on-screen instructions. If all these GOtv activation methods fails to work for you, you can simply dial gotv customer care numbers to get in touch with their support staff. The channels and number to reach gotv customer care is provided below for your learning. GoTV Nigeria Contact Address: Plot 1381 Tiamiyu Savage Street, Victoria Island Lagos State, Nigeria. For those who do not love reading in bullets, there’s a video guide on how to install GOtv services. It was created and published by GOtv some years back. 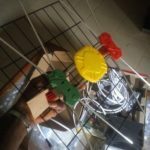 You can use it to get a pictorial/media instruction on how to install a GOtv antenna. Click the play icon below to watch the GOtv installation tutorial video. This might come in handy for those mounting their GOtv antenna far away from the TV/Decoder position. It would also come in handy for students that are tapping from their distant neighbors. If joined correctly, you’ll hardly notice a distortion or reduction in signal quality/strength. So here’s the best way to join a GOtv coaxial cable. It can be used for DSTV, Startimes and etc. Step 1: Buy an F-type Female to Female Coaxial Cable Joiner and a couple of RG6 (F connector) cable screw/pin. 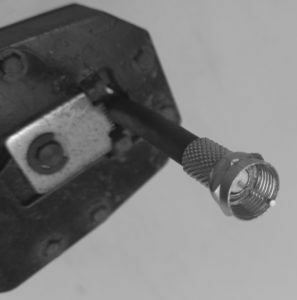 Step 2: Use a sharp cutting tool (A knife, razor blade or an electronic cutter would be enough) to carefully remove the outer cover of the cable and that of the inner insulator as seen in the screenshot below. Step 3: Carefully place the RG6 Twist-On F-Connector screw to the surface and repeat step 1 to 3 on the other end of the coaxial cable. Step 4: Fit in the screws to both end of the F-type coaxial cable joiner to complete the process. And that’s all. Your coaxial cable is joined correctly and would hardly cause distortion. 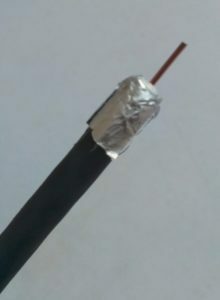 Note: If the joined part of the cable is exposed to rain, you can coat with a black solution tape (cellotape) to prevent corrosion, rusting and other forms of damages. Irrespective of whichever method you choose to activate your GoTv decoder with, the decoder will be properly activated if you follow the processes correctly. The tutorial is aimed at guiding you on how to install a GOtv digital terrestrial TV services by yourself. Even though it is provided without any guarantee, it should be able to help anyone install GOtv services by themselves. Do not fail to get in touch with us if there’s a thing or two you’d need a help with. If you are interested in getting this GOtv installation tutorial as a PDF, do notify us below. We’ll forward same to your email address as soon as we get your comments. What exact problem are you having when trying to search for networks? Thanks for dropping by Chucks, I’ll send that across to you. Who did the first installation for you?